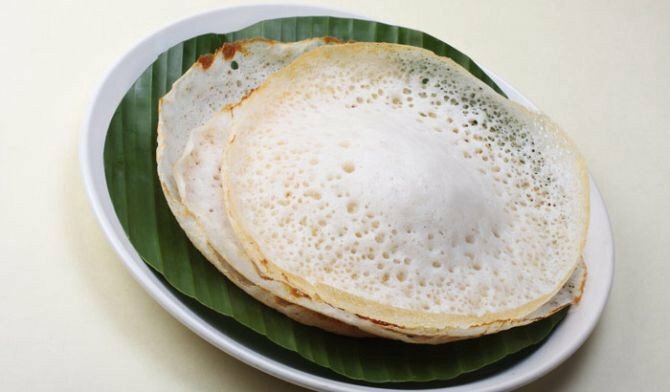 Appam is a type of pancake, originated in the Indian subcontinent, made with fermented rice and coconut milk batter It is a common food in the south as Kerala, Tamil Nadu. It is eaten most frequently for breakfast or dinner.its very healthy and quick to make the white lacy pancake have a crisp side with an airy soft touch. Take a small bowl to add dry yeast and 1tsp sugar and 1/3 cup of warm water mix it well, cover it and keep aside for 10 minutes. Take a mixer grinder jar to add soked rice and cooked rice and warm water approx half cup, 2tsp sugar and blend then in a smooth paste. Keep aside. Take a deep bowl combine the ground paste, salt and add prepared yeast mixture mix it very well and keep aside 3- 5hours. when the batter is formatted, heat an appachatti (appam kadhai)lightly greased pour a ladleful batter into it slowly rotate the kadhai in a circular motion so lacy thin layer formed side while little thick in the center. Put a little oil or ghee on the edges, cover with a lid and cook on a slow flame2-3 minute, remove the appam when the center fluffy part is cooked. Appam is ready, repeat with remaining batter to make more appams. Appam serves immediately with navratan korma or any vegetable stew or coconut stew.